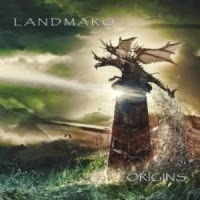 With the band approaching 25 years in “the business” next year, the UK band, Landmarq have issued an anthology album entitled, Origins: A Landmarq Anthology 1991-2014. The band has previously issued 5 studio albums and 3 live albums, but now we have a compilation of the best of these releases since the debut in 1991. This new release, Origins, is a double album with one disc dedicated to the “newer” Landmarq, featuring Tracy Hutchins as lead vocalist and the second disc is the earlier material, which features Damian Wilson as the lead singer. Disc one of the set is subtitled “The Tracy Years” and features material from 1998 onwards and is a mixture of studio and live recordings, and includes a new track, “Origins,” specially written for this release. The musicians involved on this disc are Uwe D’Rose (guitars), Steve Gee (bass, fretless bass, vocals), Dave Wagstaffe (drums, percussion, vocals), Martin Varty (piano, keyboards, violin, viola, vocals) and Tracy Hutchins (lead vocals). Disc Two, subtitled “The Damian Years” features material recorded on their first 3 releases, Solitary Witness (1992), Infinity Parade (1993) and The Vision Pit (1995) and apart from Uwe, Steve Gee and Dave, the band also included, Steve Leigh (keyboards) and Damian Wilson (lead vocals), with Damian replacing the original Landmarq vocalist, Rob Lewis-Jones in 1991. Over the 18 tracks spread over the two discs of Origins, all the previously released albums are well represented and the set has a running time of around 146 minutes, with each disc very close to 73 minutes. The shortest track on offer is “After I Died Somewhere” from disc 1 at 4:42 minutes and the longest track appears on disc 2 and is “Ta Ji’ang,” playing in excess of 16 minutes (16:31). Dealing with the discs in chronological order, disc 2, The Damian Years, covers the “early” material and gives a terrific insight into how the band evolved even in the short time of the initial 3 album releases covering 1992-1995, prior to the vocalist joining Threshold. The earliest tracks, “Killing Fields” (4:52), “Forever Young” (8:54) and “Borders” (5:01) show superb guitar work from Uwe, crisp clear vocals from Damien, some majestic keyboards from Marty and moments that sweep from the heavily driven to the lighter ethereal. Moving onto the tracks from Infinity Parade, it seems strange to find a track that bears the same title as the previous album, “Solitary Witness” (6:50) but this is repeated in albums 3 and 4 as well. ”Solitary Witness” shows, in just under 7 minutes, the maturity of the band and is an excellent slab of progressive rock. “Ta Ji’ang” (16.31) is in a very different style with the band pushing the boundaries and delivering an epic piece of music which encompasses the floating ethereal passages before moving effortlessly into the harder driven passages. “Embrace” (6:27) shows another side of the band with a slower paced builder of a track, stunningly melodic and showcasing the superb guitar of Uwe. Two years further on, The Vision Pit, continues to show the band growing musically within the examples of “Pinewood Avenue” (6:25), “Narovlya” (11:11) and “Bed of Nails” (7:14). The fact that the tracks are relatively long allows the band to integrate more within the tracks, to allow the music to evolve naturally. They are testament to the ability that the band now possesses. Moving to the newer material on disc 1, The Tracy Years, there are a couple of tracks from the earlier albums “Tailspin” (5:11) and “After I Died Somewhere” (4:42), from Infinity Parade and The Vision Pit respectively, but are live versions featuring the “new” female vocalist. I thought that this was a clever way to integrate the changing phases of Landmarq. With the guitarist and the rhythm engine of the band remaining intact, the overall “sound” of the band continues the evolution evident in the earlier albums, with perhaps, at least in the tracks contained here, a little more emphasis on the keyboards and, of course, the change in the vocal delivery. Tracy Hutchins has a range of delivery in that she can be forceful, powerful and attention grabbing with her vocals, but can sound angelic, child-like and fragile at other times. The band highlight 4 tracks from Science Of Coincidence, “Lighthouse” (10:55), “Science Of Coincidence” (5:17), “Between Sleeping and Dreaming” (9:23) and “Heritage” (5:58), with the latter 2 tracks again live performances. While shorter tracks are interesting with some terrific hooks, I feel the band sound more comfortable within the context of longer excursions, and “Lighthouse” is an example of this. The newest studio album is the source of 2 excellent tracks, “Turbulence” (12:29) with some majestic keyboards and “Personal Universe” (7:49) which is just one of those tracks that gets “inside your head.” The new track, “Origins” (11:01) brings proceedings to a close with another example of a band that is very comfortable with where they are at the moment. It will be interesting to hear a new album carrying on from the “Origins” track. Anthology albums are primarily designed to pull in new followers and “Origins” is an excellent example of this genre. Covering all phases in the history of the band, Landmarq, this release should do exactly what it is expected to do, boost the number of the band’s followers. This is a terrific selection of tracks which never let up or flags over the 2 discs, and shows the excellence of this, I believe very under-rated, band. Both stickers, “One To Buy” and “The Experience will last Forever,” adorn the front of this album. If you have not listened to the music of Landmarq, the release of Origins means that you now have no excuse and after a few listens, I can almost guarantee you will realize just what you have been missing out on.